Forgive me Canada’s Food Guide for I have sinned. I’ve packed my children’s lunchboxes with fruit flavoured drinks instead of pure juices; fruit chews instead of real apples, oranges or bananas. I have turned a blind eye to sugary cookies, greasy potato chips and decadent pudding cups. I’ve financially supported a high-fat, high-sugar diet through school-sponsored pizza, fast food and birthday treat days. Like so many Canadian parents, I have succumbed to the evils of convenience, taste, mass advertising and peer pressure over nutrition. What’s wrong with that you ask? The experts tell all. Kids naturally prefer the taste of Oreo cookies to carrots. Right? According to The Hospital for Sick Children’s book Better Food for Kids there is no evidence to suggest this. “Children can learn to like healthy, nutritious foods just as easily as sweets and other junk foods,” they encourage. Who taught them to like high sugar, high fat foods? An effective way to change your family’s diet is through the art of substitution. 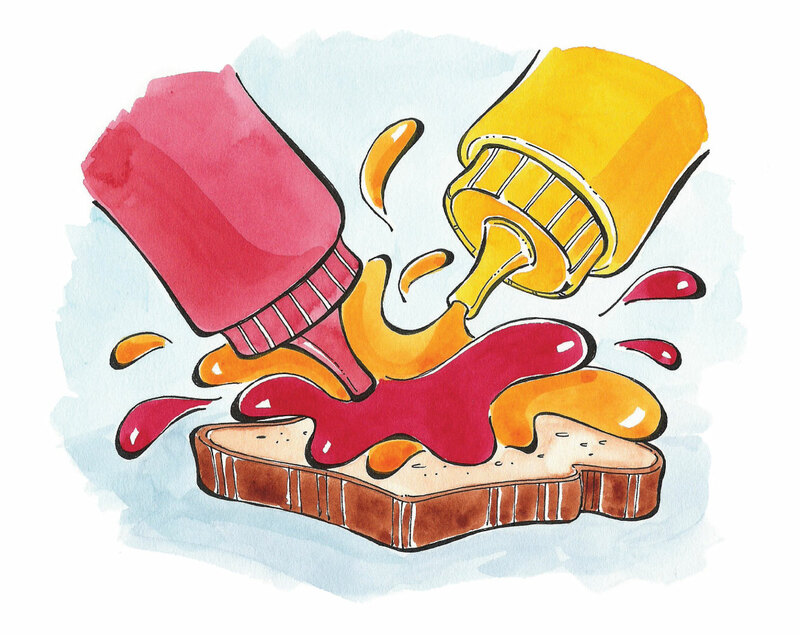 “If your ravenous kids go rooting around the kitchen like truffle pigs and find dried fruit in the cookie jar, bottled water in the fridge, and frozen yogurt in the freezer, they’ll improvise,” she suggests. We all know eating healthy is good for our bodies, but we may not fully appreciate the damage we’re doing when we eat poorly. Dr. Michael Lyon, the Vancouver-based co-author of Is Your Child’s Brain Starving says North Americans consume too much sugar, starch, and fat, as well as too many synthetic chemicals. The results are epidemics of obesity, heart disease and diabetes. According to the Canadian Diabetes Association, children are getting Type 2 diabetes at an alarming rate – shortening lifespans by an average of 13 years. Scientists have linked Type 2 diabetes to diet, weight and physical activity, as well as high cholesterol and blood pressure. What’s equally alarming is the impact poor dietary choices have on the brain. “Packaged, so-called convenient, fast foods are damaging to our brain chemistry,” stresses Dr. Lyon. “Behavioural symptoms of too much fat, sodium or sugar are irritability, restlessness, and lethargy.” If we want our children (and ourselves) to have healthy brains, we must stop eating junk food, pesticides, food additives and genetically modified organisms (GMOs). No big deal if your child skips breakfast? The physical fallout is devastating explains Dr. McAllister: The liver spits out the last of its stored glycogen. Blood Glucose levels are extremely low. Deprived of fuel, the brain sputters causing headaches and dizziness. Concentration and coordination are shot. IQ drops about 50 points and short-term memory is seriously impaired. Adrenaline triggers tremors, sweating and nervousness. Is this how you want your child to start their day? Beware! Feeding your children packaged breakfast cereals – or what Dr. Lyon calls “sugar coated, artificially flavored, chemical laced starch, ‘fortified’ with a sprinkling of a few of the hundreds of nutrients that were stripped out during processing” – is not the answer. To prevent roller coaster blood sugar levels, a high fibre, high protein breakfast is recommended. A Kit Kat for Lunch? Give Me a Break! Some parents send teens to school with spending money rather than a home-packed lunch – believing their children will make healthy choices in the school cafeteria. Let’s look at the young girl I saw purchase a Kit Kat chocolate bar from a school vending machine. Was it a quick sugar hit between classes? Dessert after a nutritious lunch? Neither – it was lunch! Ready to dust off the old lunchbox yet? Thermoses filled with hot soups, leftover stews or pastas. “Sandwiches” made with pita pockets, raisin bread, whole grain bread or rice cakes. Fillings such as tuna, salmon, egg salad, hummus, soy alternatives, cheese, leftover chicken or meatloaf. Fruits and vegetables with light salad dressing or flavoured yogurt dips. Involve your children in the lunch making process but leave out the junk food. Dr. McAllister encourages parents to practice what we preach and take our own healthy packed lunch to work. When it comes right down to it, nothing is more important than the health and well being of our families. Consider the time and commitment you’d make for a seriously ill child. Changing old, unhealthy habits would take considerably less time and commitment. Think about it. What better back-to-school gift could a parent give a child? 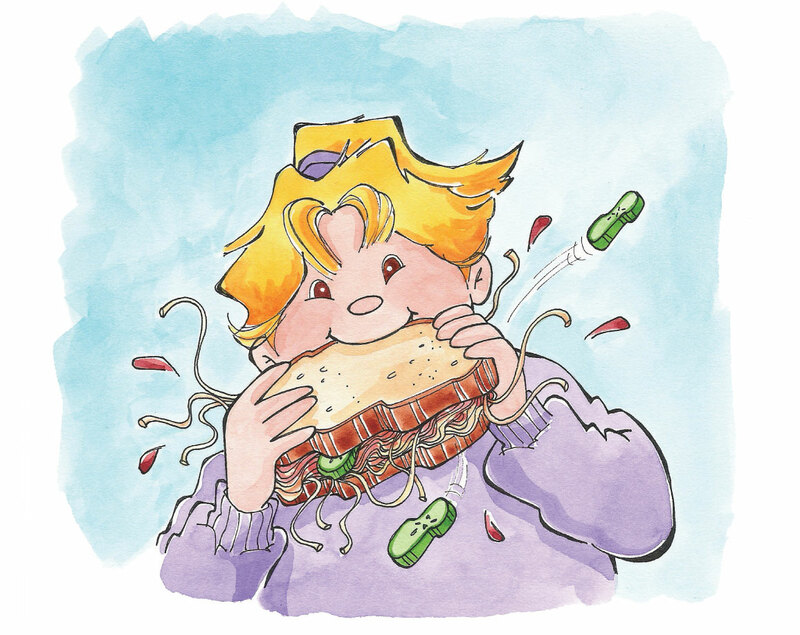 [ Illustrations from Samantha’s Silly-icious Sandwiches by Tina Powell. 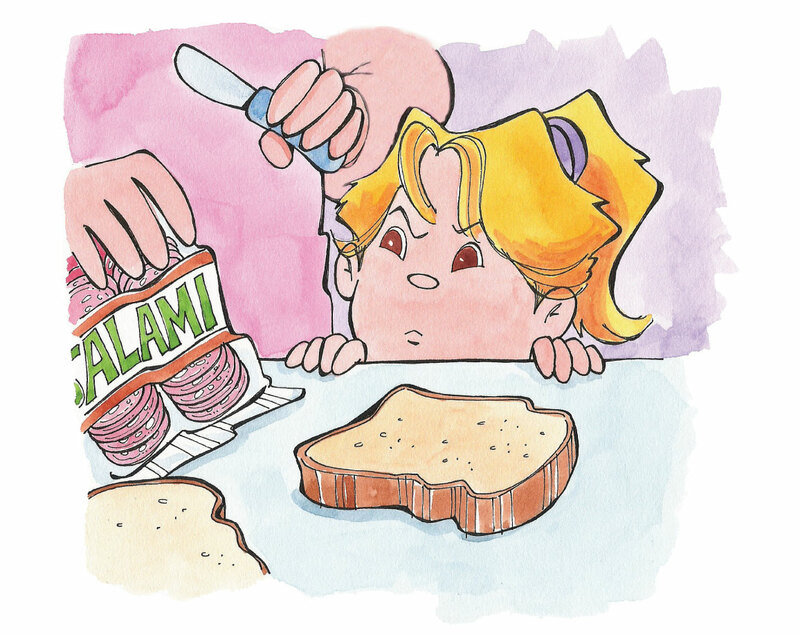 Samantha is sick of eating the same old, boring sandwiches for lunch. All the other kids have lunches that are fun. All the other kids have lunches that are exciting. 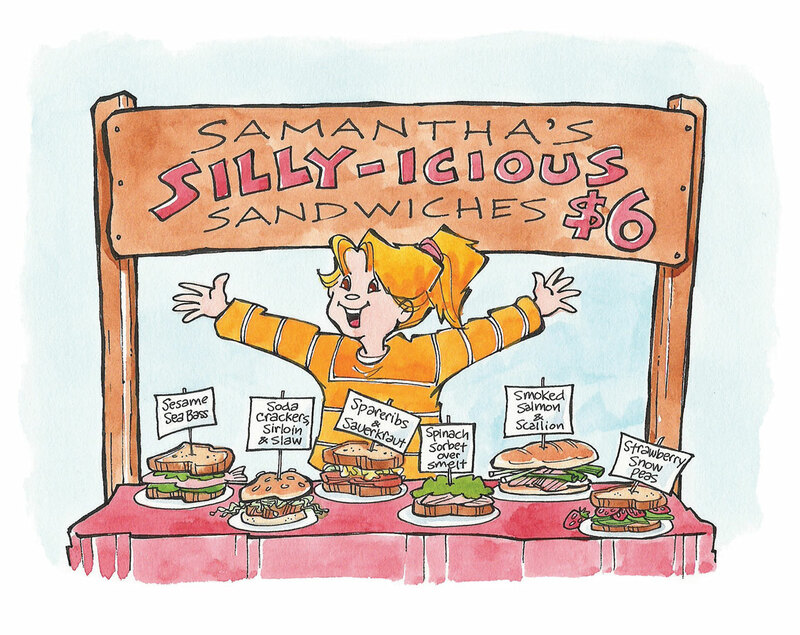 Samantha takes matters into her own hands—and the results are silly-icious. 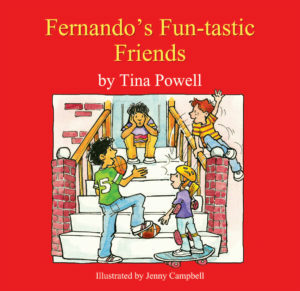 This story encourages sharing, self-reliance, and a fun approach to nutrition. 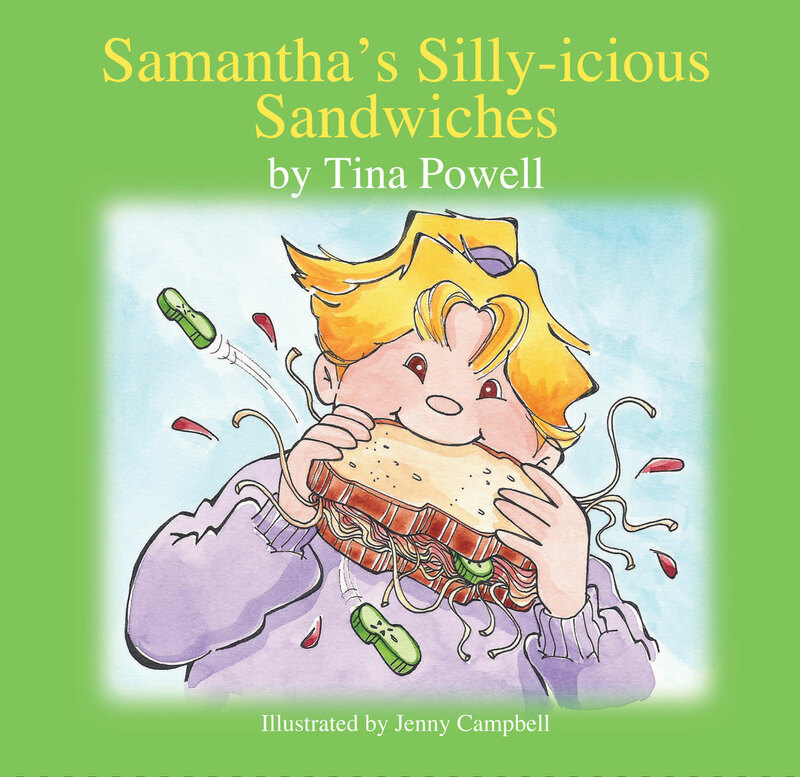 To learn more about or to purchase Samantha’s Silly-icious Sandwiches, visit Tina Powell’s Book Boutique. Thumbs Up For Family Fitness! Our thumbs have taken over. How did it happen? Perhaps it was when we got TV remote controls and stopped getting up off the couch to change channels. Or maybe it was when we let our thumbs do the walking while we did the talking on wireless telephones and handy cell phones. Our kids have hyper-thumb-mania, too. Ever notice how their little thumbs dance across video game controllers while they play virtual football or basketball? It must be exhausting – for their thumbs! The fact is our thumbs are getting a great workout! But what about the rest of our bodies? “Over half of Canadians aged five to 17 are not active enough for optimal growth,” says the Public Health Agency of Canada. Since the 1980’s, the prevalence of overweight children has doubled and obesity has tripled.Pediatricians and family physicians are already seeing weight-related health problems in children, such as high blood pressure, type 2 diabetes and high cholesterol. “Kids younger than eight spend two and a half hours a day watching TV or playing video games, while kids older than eight spend four and a half hours doing the same,” reports the Heart and Stroke Foundation of Canada in their book Fit Kids – A practical guide to raising healthy and active children from birth to teens (Dorling Kindersley Ltd., 2004). Computer and video games are addictive insists Dr. Frank, “They’re designed to engage you psychologically to such an extent you find it impossible to turn off the machine and go to supper. ”The experts agree that limiting “screen time” is critical to families getting more active. What’s a good limit? Fit Kids recommends no more than one to two hours a day watching TV or playing computer games. And never place a TV screen or computer monitor in a child’s bedroom – no matter how many tears it causes. Canada’s Physical Activity Guides (www.paguide.com) state that children should work toward at least 90 minutes of physical activity each day! We know our families should be more active. But how? Busy schedules, long commutes, expensive sports equipment or fees, and concerns over neighbourhood safety often get in the way.We’re stuck contends Dr. Frank. “We’re stuck because we’re not willing to stand up, speak out and say, ‘Hey, this is a disaster!’”It’s not going to be easy, but you can make family fitness safe, accessible and fun. It’s time to stand up and get your family moving! Parents must lead by example. “A child who has active parents is six times more likely to be physically active,” reports Fit Kids. If that means actually going to the gym three times a week, joining a softball league or dusting off your bicycle, get moving. And stop your complaining! If you grumble about exercise, so will your kids. 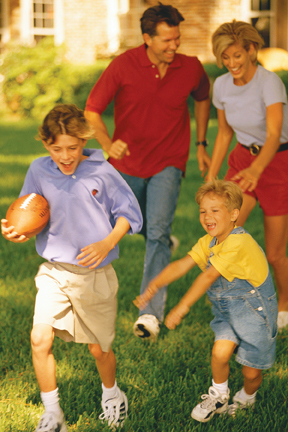 Families will exercise more if they’re having fun. Inline skating, tag, scavenger hunts, swimming and bike rides are all fun ways for families to get physical. Is my child enjoying positive interaction with peers and coaches? Are they receiving praise and support? Have they mastered a new skill and are proud of it? Does my child enjoy the way this activity feels? Brooke (10) likes to play soccer and volleyball… but she loves to play hide-and-go-seek with her friends! She says she’d be more active if she could go to the park more. Have family members take turns picking group activities. As much as you may like a Sunday morning bike ride, the kids may really want a game of basketball. By taking turns, everyone gets to do something they love and variety is essential to an active lifestyle. Stephanie (11) enjoys dance more than TV or computer games. She says if her parents want her to be more active, they should suggest some camps that have lots of activities and let her pick the one she likes best. Bored with family walks and bike rides? Think beyond the traditional. Try bowling, golf, kayaking, curling, horseshoes, badminton, hip hop, or karate. Or better yet, create your own family games. On rainy days, plan fun indoor games. In their book, 365 Unplugged Family Fun Activities, (Da Capo Lifelong Publishing, 2004) Steve and Ruth Bennett suggest Bocce Socks, Balloon Decathlon and Shooting Hoops in the living room.Trevor (12) has a conditional junior black belt in karate. His favourite physical activity is playing a game he invented called Blitz Ball. He says that it’s kind of like soccer, but you get to pick up the ball. If your house is filled with electronic equipment, your family will play electronics. If it’s filled with games and sports equipment, they’ll play games and sports. Fit Kids suggests stocking the garage with a basketball, baseball and glove, football, soccer ball, volleyball and net, tetherball set, badminton set, flying discs, sidewalk chalk, jump rope, croquet set and inline skates. At garage sales you can pick up used sports equipment affordably. Children love to help around the house. It makes them feel grown-up and important. Fit Kids suggests household chores are the ideal way to sneak physical activity into your kids’ schedules and keep your house running smoothly. Sweeping, vacuuming, washing the car, raking leaves, walking the dog and cleaning their rooms are just some chores to try. (My son got an amazing workout moving the family video collection upstairs three movies at a time). Before you automatically jump in the car to run a family errand, determine if you can walk or ride bikes instead. If you must drive, park a few blocks away. Bypass the elevator or escalator and take the stairs. Sure it may take a few moments longer, but think of what you’ll gain in the long run. Your kids may even start walking to school. Dr. Frank laments, “If you’re driving your kids to an activity that also involves no physical exercise, you need to think about how to make that different.” It may mean walking the kids to computer camp or switching them to basketball camp. Or, add physical activity before or after a sedentary activity. Support your family’s commitment to physical activity with activity menus, activity logs, fitness contracts and goal setting suggests Fit Kids. Display them on the refrigerator to keep physical fitness at top of mind for everyone. Campaign for increased child safety at playgrounds, parks and on roads. Designated crosswalks, neighbourhood watch programs and well-constructed playground equipment improves outdoor safety. Families, give your thumbs a break! Put down the remote control, cell phone and game controller. Pick up a new, active lifestyle! Your exhausted little thumbs will thank you.